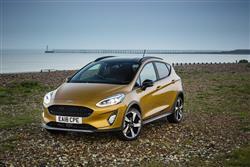 Today, Ford's Fiesta range must appeal to a more diverse cross-section of buyers than ever before. 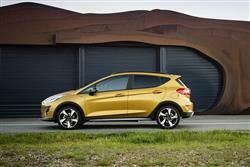 Hence the need for this Active variant, the first ever Fiesta crossover model. It isn't really any sort of SUV, but it might be an interesting alternative to one for quite a number of small car buyers. Here's a Fiesta - but not quite as you know it. For those who kind of like the idea of a small SUV but aren't quite ready to take the plunge, the Fiesta Active might be just perfect. A few off road cues, some extra traction for slippery surfaces and efficient running costs will all make it tempting to those wavering on the brink of small Crossover ownership. The differences over an ordinary Fiesta are small. Which is good news in many ways because there's lots about an ordinary Fiesta that's brilliant - including drive dynamics which we're hoping won't have been harmed by the 'Active' package. 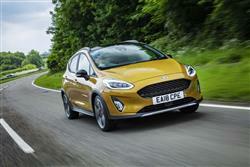 Ford insists we needn't worry on that score and reckons this Active variant will account for up to 15% of Fiesta sales going forward. Here, we're trying the popular 1.0T 125PS 'B&O Play' version. Most of the engineering effort here has been put into countering the potential handling downsides of the raised ride height that the development team knew this Fiesta Active model would have to have. There's 18mm of it - just enough to better cope with a bumpy track but not enough to deal with any terrain much more adventurous than that. 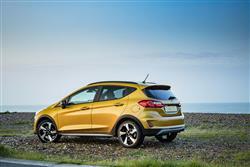 You don't get 4WD of course but Ford has added a bit of substance to the lifestyle rhetoric by equipping all Fiesta Active models with a Drive Modes set-up featuring a selectable 'Slippery' setting which tweaks the traction control to help the front wheels better cope with unmade tracks and poor conditions. Other changes include a 10mm wider track, suspension revisions and optimised front shock absorbers that feature a special hydraulic rebound stopper that smooths out the bumps or jolts you'd get over rougher surfaces. 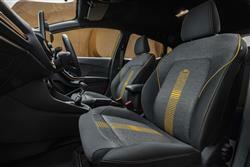 Fortunately, none of this has significantly detracted from the standard Fiesta's class-leading handling package. True, the ride's a tad firmer, but it's still impressively supple over broken urban tarmac surfaces, aided by those special front shock absorbers we mentioned. Get beyond the city limits and Fiesta regulars might notice a touch more body roll than you'd get on the ordinary version of this car, but it's nothing significant; certainly not enough to detract from the kind of handling poise that's a world away from the SUV norm. Active buyers looking for petrol power get Ford's three cylinder 1.0-litre EcoBoost engine in four different states of tune. We tried the 125PS version, but 85, 100 and 140PS variants are also on offer, plus a couple of 1.5-litre TDCi diesel units. 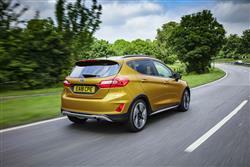 In Active form, this Fiesta certainly has a more purposeful gait. In fact it's surprising just how much visual difference an 18mm increase in ride height can make, though of course the whole effect is amplified by all the styling changes made to this more outdoorsy variant. The profile perspective shows them off best, the extra distance away from the deck emphasised by dark plastic cladding that flows round the wheel arches and covers lower sills that also feature silver trimming. The 17-inch 5-spoke alloy wheels are unique to the 'Active' too. 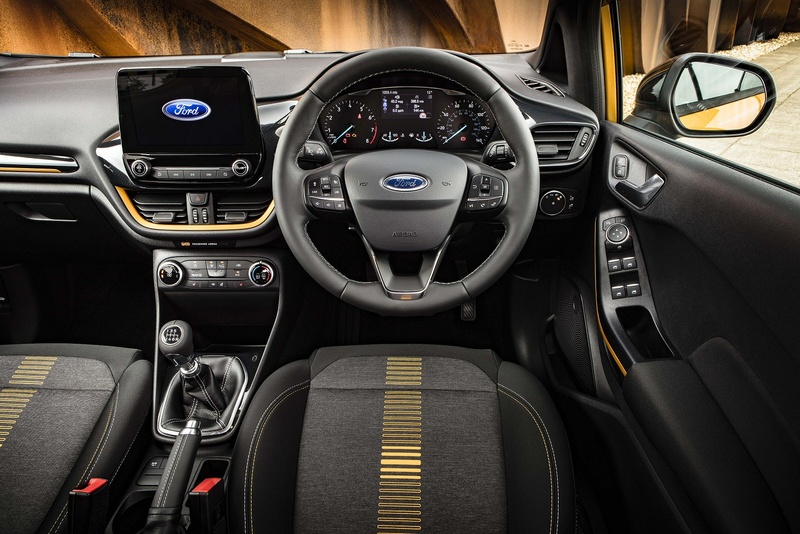 Inside, Ford says the upholstery and the trimming materials have all been specially tested for the outdoor-orientated needs of SUV-style customers - the muddy boots, sandy beach towels and soggy passengers that this car will be expected to take in its stride. Standard is the brand's latest 'SYNC 3' infotainment set-up, which allows for easy app integration and functionality that allows you to duplicate the operation of your smartphone onto the central fascia screen via either 'Apple CarPlay' or the 'Mirror Link' 'Android Auto' system. Get yourself into the back seat and if you're not familiar with this MK7 model Fiesta, you might be pleasantly surprised at the amount of legroom on offer - 16mm more than was available with the previous generation car. Plus there's a 292-litre boot. If you were thinking that going for a 'ruggedised' version of an ordinary supermini might be a slightly cheaper route into the SUV lifestyle than buying a purpose-designed small 'Juke'-genre crossover, the Fiesta Active pricelist might cause you to pause for thought. 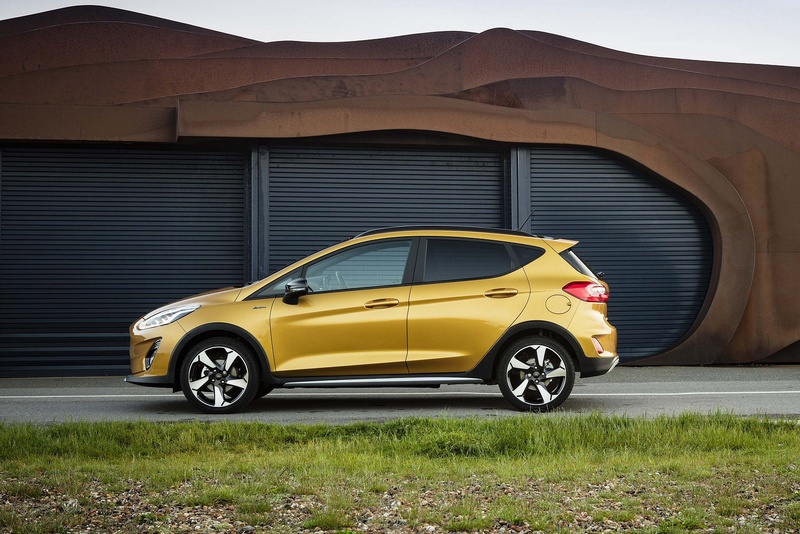 Only the five-door Fiesta body style is on offer and typically, you're looking at paying somewhere in the £18,000 to £22,000 bracket for it - which is the sort of spend that would get you into any number of little SUVs. Including the Ford EcoSport model you'll find on the other side of the Blue Oval brand showroom in which this car will sit. The spec line-up starts with 'Active1', then progresses through 'Active B&O Play' to 'Active X'. If you use 'Active 1' as your starting point, you're looking at needing £1,100 more to get to the 'B&O Play' grade we tested - or £2,200 more if you want to go the whole hog and try a top 'Active X' variant. In all three cases, there are 100 and 125PS versions of the 1.0T EcoBoost petrol powerplant on offer, the 100PS unit being the only one in the range available with the option of automatic transmission - a 6-speed Powershift set-up that costs £1,350 more. Bear in mind that if you go for the auto, you'll lose the 'Slippery' drive mode option that manual models have. 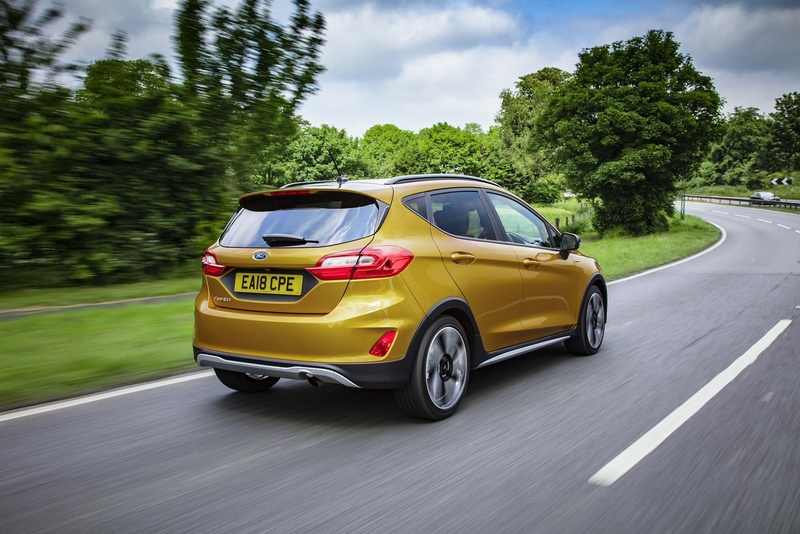 One of the reasons you might choose this Fiesta Active over a purpose-designed SUV like, say, Ford's EcoSport is to minimise the running cost downsize associated with this kind of car. Sure enough, this Fiesta model is able to achieve that. If your point of comparison is the EcoSport, then, thanks to sleeker aerodynamics and a 39kg weight advantage, this Fiesta Active looks useful more economic. 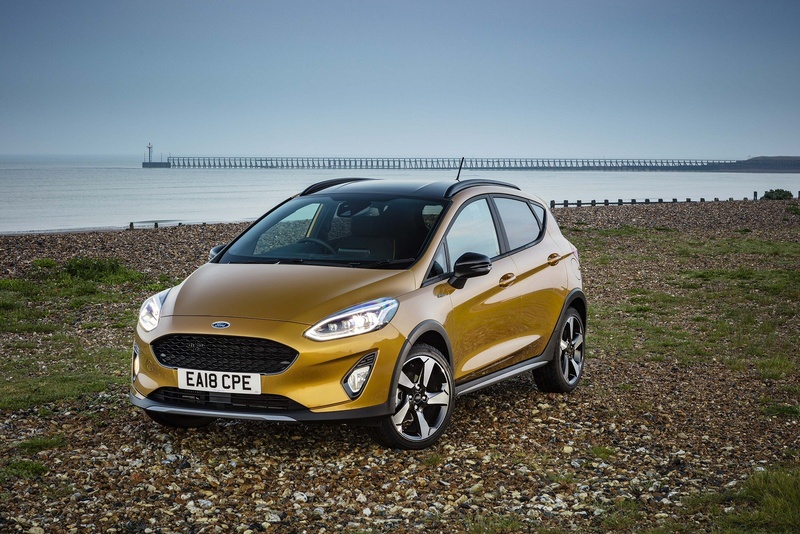 With the 1.0T EcoBoost petrol powerplant that most customers choose in 85, 100 or 125PS guises, an EcoSport's returns - 53.3mpg on the combined cycle and 121g/km - are improved to 56.5mpg and 113g/km in a Fiesta Active using exactly the same engine. There's obviously a slight downside against a conventional Fiesta - about 5% thanks to this 'Active' variant's higher ride height and larger wheels. What else? Well we'll tell you about servicing, which on both engines is required every two years or 18,000 miles - whichever comes first. Two pre-paid servicing plans are available; one that costs £340 and covers you for two years and two services; and another that costs £550, is transferrable to future owners and covers three years and three services. 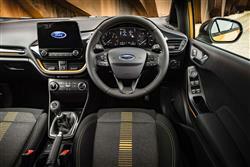 Maintenance bookings can be done online through the 'My Ford' portal. This is part of the 'Ford BlueService' scheme that wraps up all of the care and maintenance of your car into one bundle that includes a free 30-point 'eCheck' of vital parts and highlights any work required with a red, amber and green traffic light warning to rank items that need attention in order of importance. If you�re looking for a new Ford Fiesta 1.0 EcoBoost Active B+O Play Nav 5dr Auto Petrol Hatchback for sale, you�ve come to the right place. At Bristol Street Motors we don�t just have the best Ford Fiesta 1.0 EcoBoost Active B+O Play Nav 5dr Auto Petrol Hatchback deals, we also offer friendly advice and help with all your enquiries to ensure your buying experience is a happy experience.